NOAM CHOMSKY is widely regarded as the most influential thinker of our time, but never before has he devoted a major book to one topic, income inequality: "During the Great Depression, things were much worse than they are today, but there was an expectation that things were going to get better. There was a real sense of hopefulness. There isn't today.. Inequality is really unprecedented. In terms of total inequality, it's like the worst periods in American history. But if you refine it more closely, the inequality comes from the extreme wealth in a tiny sector of the population, a fraction of 1 percent.. Not only is it extremely unjust in itself, inequality has highly negative consequences on the society as a whole because the very fact of inequality has a corrosive, harmful effect on democracy." -NOAM CHOMSKY, in Requiem for the American Dream Requiem for the American Dream is not an essay collection but an entire work of some 70,000 words based on four years of interviews with Chomsky by the editors. Chomsky considers these to be his final, long-form documentary interviews. It is a book that makes Chomsky's breadth and depth accessible, and at the same gives us his most powerful political ideas with unprecedented, breathtaking directness. It will go down as one of his greatest and most lasting contributions. 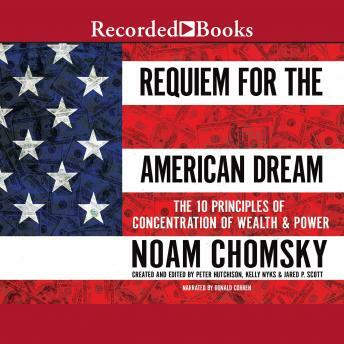 Requiem for the American Dream is being produced in tandem with the film of the same name that was recently released in selected theaters to rave reviews and standing ovations and will be on Netflix and touring colleges prior to the book's release.